The Yukon Outfitters Prolite Pillow is more accurately described as an insulated, self-inflating, multi-use pillow. This was another surprise gear review opportunity from YO with a product they were adapting for their new line of hammock gear. The Prolite pillow is a self-inflating insulated camp pillow that has attachments to work with a hammock. The pillow can be used anywhere, of course, and can be used as a sit pad or knee pad. The outer shell is somewhat stiff, but the overall design is what you might expect from a Therm-a-Rest pad. The Prolite pillow is actually pretty competitive for its class. The self-inflating yet inflatable (by blowing into the valve) design allows for quick inflation and immediate use. It packs down pretty small. In my use, I hardly used the stuff sack, preferring to deflate it and stick it at the bottom of my pack flat. One of the first things I did was cover the pillow with a pillowcase. I seem to always carry a microfiber head buff—a tube of fabric that has multiple uses. I find the shell on the pillow a little stiff and plastic, but adding that microfiber pillowcase makes all the difference in feel. The pillow itself is very warm and comfortable. I don’t always use a pillow when I sleep in a hammock, but when I do, my preference is for a neck pillow, or a pillow with no back but has side panels. This is because I find the hammock does a good job of supporting the back of my head, but I do like having something to rest the side of my head on. With that, I don’t find the Prolite very comfortable in a hammock unless it is deflated almost entirely. 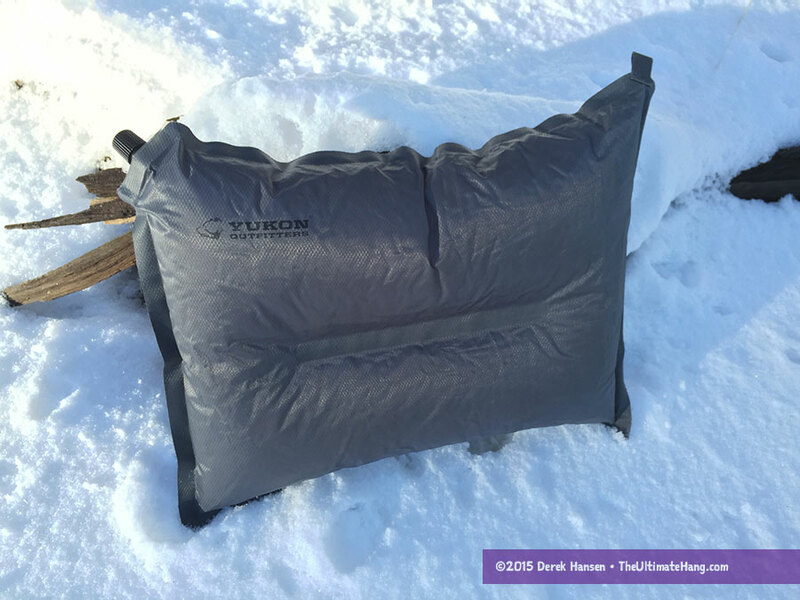 The insulation makes it a great addition for cold or winter camping. I just don’t use it fully inflated. My wife and kids, on the other hand, love pillows in their hammock and this pillow is often fought over. The design is basic, but it does the job well. The insulation is a really nice feature and makes this pillow a good option for cold weather. Because of its durable and sturdy construction, it works well as a sit pad or knee pad. I often used the pillow as a sit pad, insulating my backside from getting cold. If you are a pillow person, this pad may be a great fit. I would recommend getting a pillow case. The included shock cord is a great addition for hammock campers because it prevents the pillow from sliding to the center of the hammock. Curious to know where you got your microfiber pillow case Derek? Oh, it is just my head buff. I have dozens of them and use them everywhere. Woot has these for sale once in while, and I picked one up last time (http://sport.woot.com/offers/prolite-pillow-2-colors-8). At $14, it was a spectacular deal. It’s nice to know that it works as a sit pad too, as I’ve only been using it in the hammock (constantly changing the pressure until I find that sweet spot). I’m finding that the whole Yukon Outfitters hammock line is quite a value, especially when Woot sells them. Agreed! It is very tempting. Derek. I am with you on using a neck pillow. It is very comfortable and lightweight. Have you tried different brands and types? I find the generic email inflatable one with a microfiber cover fits the bill for a comfortable night’s sleep no matter what position I’m in. I agree. I’ve used a few different pillows. I eventually made one that I hope to publish the directions soon. Outside one’s usual residence, pillows are a bulky nuisance when not actually in use. Extra clothing can work for a while but I am adverse to sticking dirty or just washed wet socks and underwear under my head. I wanted a “magic” pillow that would just “disappear” when not needed. Jacks ‘R’ Better sells a Graham FlexAir Pillow that nails it for me. One folded in half lengthwise in a cotton stuff sack supports my neck, another goes under a knee and I particularly appreciate the ability to adjust the firmness to whatever I wish.